ROTC, or Reserve Officers' Training Corps, is a college leadership program sponsored by the U.S. Military. Offered by all branches of the military except the Coast Guard, ROTC awards qualified students full-tuition scholarships as well as monthly stipends. ROTC students become commissioned officers upon graduation and must fulfill an eight-year service obligation in the U.S. Armed Forces. ROTC students receive curricular and field training in military science. Typical requirements for ROTC include three hours of classroom instruction and three hours of physical fitness training per week, a one-hour weekly leadership lab, and a one weekend field-training exercise per semester. Credits earned in ROTC programs do not transfer back to Brown. ROTC programs for the Army, the Navy, the Marine Corps, and the Air Force are offered at over 1,000 colleges and universities in the United States. Students who attend colleges that do not have ROTC chapters may participate in the program at another school near the college at which they matriculated. Brown students may join the Patriot Battalion Army ROTC at Providence College, located in north Providence. 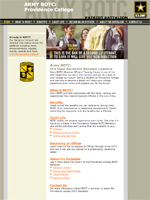 Click the link at right for more information about the Army ROTC program at Providence College. Interested students may also contact ROTC at (401) 865-2025 or [email protected]. Visit the Providence College Patriot Battalion website. Download the latest version of the Patriot Pride newsletter.